Adolph Sachse, “Detail, National Capital,” Histories of the National Mall, accessed April 22, 2019, http://mallhistory.org/items/show/348. 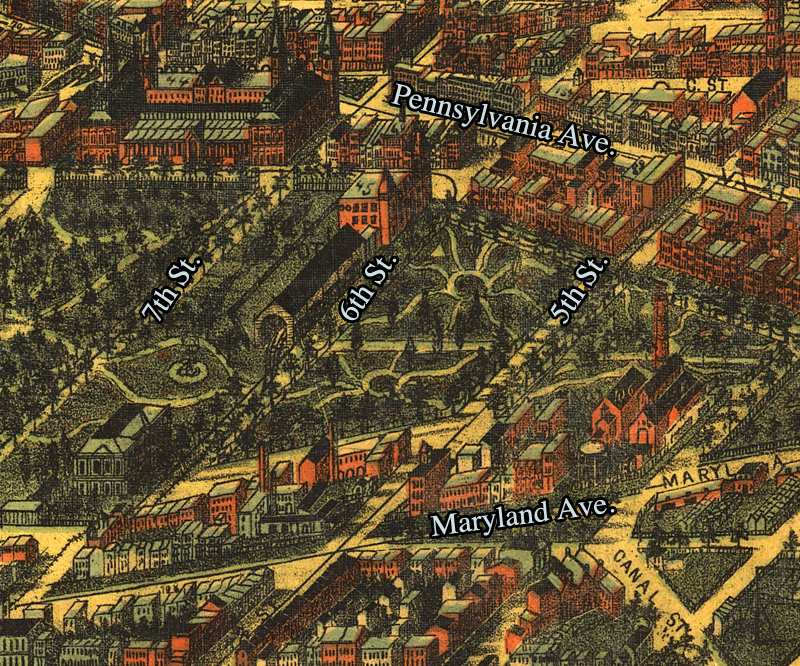 This detail of Adolph Sachse's stylized bird's-eye view of Washington highlights the section of the National Mall west of the US Capitol on present-day 6th Street. The National Mall was still parkland, a series of gardens, experimental plots, and natural landscapes. Ten years earlier, the Baltimore and Potomac Railway lines visible in this illustration were constructed through its center. Passengers boarded at the station where the National Gallery of Art stands today, and freight cars loaded from sheds among the trees of the Mall. Balti[more] A. Sachse & Co.